Brazilian photographer Didio just sent me these shots of model Fabio Cimi which I thought looked pretty cool. More pictures (and less water) after the jump. This weekend's New York Times featured a pretty cool take on the Brazilian sungas, describing them as looser fitting than the American speedos and also slightly scrunchy, "the bikini equivalent of a tent dress." The article by Eric Wilson also suggests stores in Rio, and gives a big nod to Blue Man, one of the oldest and most traditional swimwear labels in the country. Make sure to check out the article online. It looks like the weather in Rio may be better than in New York: actor Duda Nagle hit the beach in Ipanema yesterday. 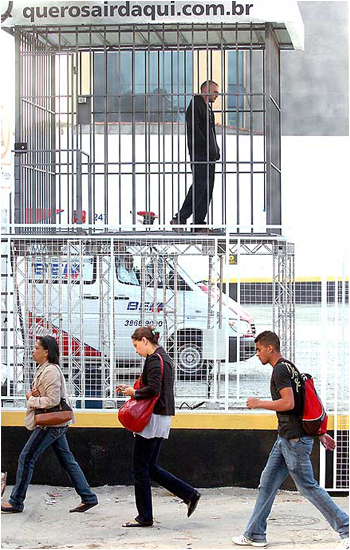 To promote the third season of Prison Break, Fox locked up an actor in a cage and put him on display in one of São Paulo's busiest avenues. The actor will not be released until Thursday night unless the right password is entered on the website Quero Sair Daqui (or I Want To get Out Of Here), which is also streaming live from the cage. If only the Brazilian prison system were this efficient. Here is a sneak peek at another story from the new issue of Brazilian magazine Junior, photographed by Didio. The magazine hits Brazilian newstands on Monday. More after the jump. Diesel owner Renzo Rosso is testing the waters for his latest project in São Paulo with the opening of his first Staff store, which will retail exclusively products from labels owned by his holding Only the Brave. With the opening of the 4,000 square feet boutique, collections by the likes of Martin Margiela, DSquared2, and Sophia Kokosalaki, will soon be available in the city. And since Rosso took a controlling stake at Viktor & Rolf last week, Staff will also retail the line in the future. The project for the first Staff boutique in São Paulo, developed by Italian Massimo Pegoraro, also involves the opening of a 10.000 square feet brand new Diesel store on the first floor of a four-story building. It will be the label's biggest store on the planet, costing R$13 million (or about US$8 million). The opening is scheduled for August 13. And to think that a pair of Diesel jeans retails for over R$800 in Brazil.